Costa Dulce means Sweet Coast in Español and that's what you'll be looking at from the yoga platform at this small and beautiful eco-lodge situated on a hillside next to its own beach in southern Nicaragua, on the Pacific Coast. This retreat will include a variety of modalities drawing from yoga and the martial arts. Early mornings will include yoga, meditation, tai chi and general fitness sessions. Morning and afternoon workshops will focus on various aspects of yoga, tai chi, chi gung, kung fu and kali silat. All sessions will be determined by your interests and will be more or less vigorous depending on the general level of experience of the group. You will have the chance to be exposed to and choose from several sessions throughout the week that will aim to restore energy and balance to your body and mind. This is a place for people who want something different – to stay in a rustic, yet comfortable and adorable bungalow hearing the sounds of the waves, to share family-style meals in the tropical breeze, and to walk from your bungalow to the pristine beach where endangered turtles come to nest. With a variety of mind-body practices offered every day, including massages, bountiful fresh air and a slower pace of life, you'll soon notice yourself winding down and finding a new daily rhythm. Your time may also include an excursion to a neighboring town, a volcanic lake, a hike to see monkeys in the vast natural park or activities such as turtle monitoring, paddle-boarding and surf lessons! There may also be the opportunity to visit an educational program serving local rural and under-served children to which we will contribute time and/or resources as relevant. You will have options! LODGING and MEALS: There are several different bungalows available at Costa Dulce. When you book your retreat, you'll let them know how many people you'll be traveling with, if you're open to sharing a bungalow with a new friend and/or which particular bungalow you'd prefer. Bungalows will be allocated to participants based on the overall make-up and needs of the group once the date of the retreats gets close. Check out the website for the Costa Dulce Eco-Resort to start dreaming of the possibilities! Meals are locally sourced and cooked by talented local cooks. Nicaraguan fare infused with a globalized flare. Fresh and delicious! Vegetarian and vegan meals are possible and all special needs will try to be accommodated. 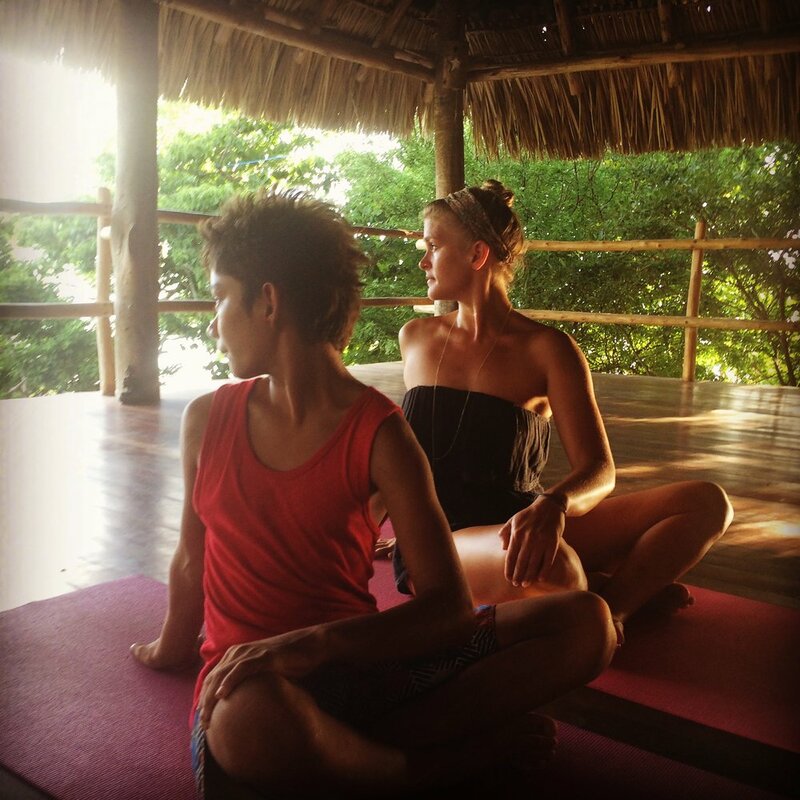 THE YOGA: Yoga will be led by Astrid Jirka, owner of Vahana Yoga & Eco-Tours and a 500 hour RYT Hatha, Vinyasa and Restorative Yoga Instructor and a possible co-instructor. Yoga will be accessible to all levels, from those who are just getting started to more advanced yogis. That beings said, some yoga experience will come in handy. We will focus on yoga that connects us to the natural world, that connects us to our roots, and that promotes rejuvenation, relaxation and good health. And for those feeling the need for a more vigorous practice, we'll be sure to give you some options! Express your interests when you sign up please. Want to learn how to hold a headstand? Curious about partner yoga? Let us know! THE MARTIAL ARTS: Martial Art modalities will be offered by Collin Lieberman, owner of Centerline Fitness and Martial Arts (add link) and a Certified Instructor in the arts of Lee Jun Fan Jeet Kune Do, Kali and Kuntao Silat. His training includes several other martial arts styles, including Taijiquan, Muay Thai, Boxing, and Brazilian Jiu Jitsu. He may be accompanied by other instructors who will also offer their talented instruction. Martial Art sessions will be available with a variety of themes but focused on overall mind-body wellness and more basic or advanced knowledge of the modalities based on participant experience. When you sign up, please let us know your interests so we can tailor our sessions accordingly! PRIVATE YOGA or MARTIAL ART SESSIONS will also be available for an additional cost. Space will be limited to 25 guests - Register early to request your preferred bungalow! Children are welcome but please inquire with Astrid first. COSTS: Prices start at $1300 for the week and will range depending on # of people per bungalow and the package you choose for your stay at Costa Dulce. Price includes a chosen Costa Dulce package + a $200 retreat fee. Children 12 and over pay full cost minus the $200 retreat fee. Children 12 and under will be arranged on a case by case basis. - Introduction to Costa Dulce's Turtle Conservation Program and an opportunity to release baby turtles if the timing is right! Option 1: RECOMMENDED. Fly to the Costa Rican airport in Liberia and Costa Dulce will pick you up from there. We will arrange with Costa Dulce to pick up one or more people together once we know who is on the retreat and what their arrival times will be. This price is FREE if you are traveling with the pre-arranged group. Please try to arrive by 2pm on Saturday. If you miss the group transport there will be a charge of $80 for up to 4 people. Time from Liberia to Costa Dulce is a 2.5 hour drive, with the addition of some possible waiting time at the Costa Rica/Nicaragua border. Visa entry fee into Nicaragua is $10 and the exit fee from Costa Rica is $12. Option 2: Fly to the main airport in the Nicaraguan capital city of Managua. The ride from Managua to Costa Dulce is 3 hours long. Pick up from the airport may be arranged by Costa Dulce if you arrive on Saturday and will be free. Otherwise, you can arrange a pick up service for a fee with Costa Dulce. Costs of pick up are 1-3 people $110 total, 4-7 people $35 pp, 8 or more $30 pp. Sadly, there appears to be no reason to stay in Managua and take a look around, but if you need to spend a night before journeying on there are some good hotel options. A variety of bungalows are available to accommodate varying needs and preferences and to provide an array of pricing options and sleeping arrangements. We will do our best to accommodate everyone according to their wishes but will ultimately make our decision based on the overall group's needs. Costa Dulce Eco-Lodge will provide meals during the retreat taking into account special dietary needs which have been disclosed. It is the responsibility of each guest to inform Costa Dulce of any allergies or dietary restrictions and to discuss these needs before the retreat begins to ensure they can be met. If needs can not be met, you will be informed and we will do our best to assist you. A non-refundable deposit of $300 must be made to Costa Dulce in order to reserve your space. Final balance will be paid upon arrival and will be based on your bungalow assignment and any add-ons. Should you need to cancel your trip for any reason your nonrefundable deposit will be withheld. And additional payment that would have been owed to Costa Dulce Eco-Lodge will become void. Vahana Yoga & Eco-Tours, Centerline Fitness & Martial Arts and Costa Dulce Eco-Lodge reserve the right cancel or to make changes to any and all aspects of this trip (which may include changes to the types and/or timing of activities during the Retreat, items and/or services included with the Retreat, and/or the itinerary) if it is deemed necessary to do so due to conditions that may be hazardous, dangerous, or otherwise adverse or threatening, or if an act or omission of a third party prevents any such aspects of the Retreat or any portion of the Retreat from occurring, or for any other reason considered commercially necessary. Should cancellation be necessary due to any such unforseen circumstances, 50% of registration deposits will be reimbursed to retreat participants as soon as possible. Vahana Yoga & Eco-Tours reserves the right to cancel the retreat prior to the start date if the minimum number of participants is not met. 100% of registration payments will be reimbursed to retreat participants if this should occur. Additional travel expenses incurred by participants will not be reimbursed. It is highly recommended that you consider purchasing travel insurance to compensate you if you run into any travel problems such as lost luggage, weather delays, personal emergencies or other unforseen circumstances. In consideration of participating in this Retreat, I agree to assume full responsibility for any risks, injuries, losses or damages, known or unknown, which I might incur as a result of participating in the retreat, including any and all activities done with the retreat group, or as an individual during the trip. I acknowledge that I will be participating in activities during which I will receive information and instruction about yoga, fitness and the martial arts and that these activities require physical exertion that may be strenuous and may cause physical injury, and I am fully aware of the risks and hazards involved. I understand that it is my responsibility to consult with a physician prior to and regarding my participation in the Retreat. I represent and warrant that I am physically fit and I have no medical conditions that would prevent my full participation in planned activities. I acknowledge that I will inform Astrid Jirka and Collin Lieberman, in writing, of any medical conditions I have which are of concern to me, before the trip start date. I knowingly, voluntarily and expressly waive any claim I may have against Vahana Yoga & Eco-Tours and Centerline Fitness & Martial Arts or its staff for injury or damages that I may sustain as a result of participating in the retreat. I, my heirs and legal representatives forever release, waive, discharge and covenant not to sue Vahana Yoga & Eco-Tours or and Centerline Fitness & Martial Arts or its staff for any injury or death caused by their negligence or other acts. I give permission to use photographs or videos taken during this trip for promotional purposes. By registering for this retreat, I understand that my registration acts as my signature and thereby acknowledge and agree to all of the policies noted above. Thank you for reading through these details. Now on to the fun part! Please fill out the form below to let us know of your interest. You can sign up for one or more people. Once we hear from you, we will be putting you in touch with the manager of Costa Dulce Eco-Lodgewho will then correspond with you directly to officially register you, take note of your bungalow preference and any of the 'add-on' options you'd like. He will also take your payment. Are you registering with another person(s)? If not, please write NO. If yes, please give me his/her name(s). What type of bungalow and/or bedding situation would you prefer? If you are hoping to stay with a friend or family member(s), please let me know his/her name(s). Example: One bungalow, 1 queen bed. Or separate bungalows with one bed each. Please tell us a little about your yoga and/or martial arts experience and your general health and fitness level(s). What about hiking and being in the outdoors? Do you have any dietary restrictions I should know about? Do you have any medical conditions I should know about? What do you hope to get out of this retreat (yoga, fitness, martial arts or otherwise) and Is there anything else you'd like me know? Nos vemos en Nicaragua! Time to start practicing your Español!